During my forced hiatus, a book chapter I wrote about celebrating Pentecost was published. First it came out as a small volume, but now you can get the whole thing. Let Us Keep The Feast: Living the Church Year at Home is an affordable guide to celebrating the church year in meaningful ways. Obviously, I find comfort and meaning from celebrating the church year at home with my family. I’ve shared over the years through blog posts about some of the ways we’ve observed the seasons. Each year I am encouraged to hear how others are keeping the church year with their own families. 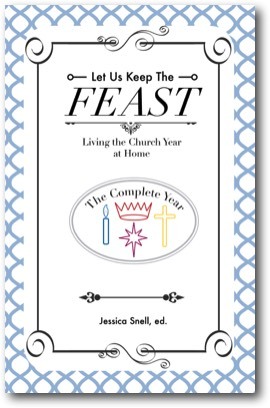 Let Us Keep the Feast provides an introduction and explanation of each season of the church year with ideas of how to celebrate and relevant recipes, readings, hymns and prayers. It is perfect for someone who is newer to celebrating the church year or looking for ideas of how to bring the church year into family life. A few people over the years have mentioned turning my blog posts into a book, and honestly this is exactly what I had in mind. I am thankful that Ed Eubanks at Doulos Resources connected me to this project after it was already underway. The book is only $3.99 on the kindle or in PDF / epub. The publisher offers free digital copies for those who buy a print edition, if you are the sort who likes your books in multiple formats. As we wind down the last few days of Christmas, I am already thinking about how we will celebrate Epiphany; it was a treat to see what Anna had written about in her chapter as I started to plan. Of course, I will keep all my old resources up if you’d like the quick blog version. Either way, I’d love to hear how your family keeps the feast. This entry was posted in books, church year, feasting, reviews. Bookmark the permalink. Thanks for this. Just ordered my copy.